The CfDS does not call for the switching off of any necessary light, and if part-night switch-offs prove to be beneficial, the CfDS will support them. The right light in the right place at the right time is what the CfDS would like to see. If switch-offs can be replaced with better lighting policies, using modern technology giving better light control and correct quantities of light, money and energy will be saved. The impact on the surrounding countryside will be minimised. Since its inception in 1989, the CfDS has been arguing against other negative effects of inefficient lighting: disruption of wildlife habitats, intrusion into premises (involving health issues), lights left on when not needed, for example in empty car parks, and light directed into the night sky to veil the stars. In cases where all-night lighting is genuinely needed, for example in busy city centres, then the best, carefully controlled lighting technologies should be used. The ever increasing cost of electricity has caused councils to reconsider keeping inefficient streetlights on all night, and many are now turning off streetlights overnight all over the UK. Large amounts of money have been saved, and councils' CO2 footprints have been reduced. Large scale switch-offs have often been met with dire predictions of crime waves, but there is no statistical evidence to indicate that overall crime has increased. In most areas where switch-offs have been introduced, crime has fallen. For example, Essex County Council carried out large scale switch-off trials in 2008 and crime actually fell by up to a third in the test areas. Such an outcome is not surprising, as streetlights are installed to help people see what they are doing in the darkness. Unfortunately that includes criminals. In fact most break-ins occur in broad daylight when premises are empty. Install efficient street-lighting Efficient lighting should always be installed to minimise energy use, prevent light pollution and nuisance to neighbours. Wildlife will also benefit from a natural night. 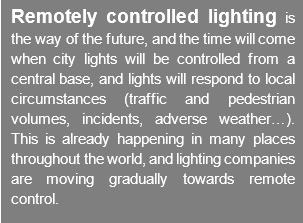 Efficient lighting shines light only downwards towards the street, and not into people's homes, or into the sky. Modern full cut-off, energy efficient streetlights are the solution. LEDs are becoming commonplace due to their lower energy usage and longevity. However it is essential that blue-rich lighting is avoided due to the growing evidence of adverse effects on animals and humans. 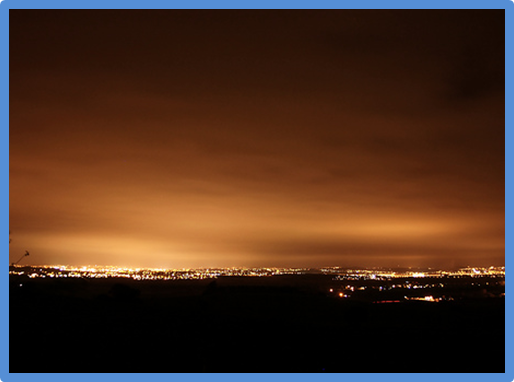 Over-bright blue-rich LEDs will create more skyglow by reflection than lights that they replace. For more information on this subject, see our Good Lighting page. Use dimmable streetlights New technology allows streetlights to be remotely controlled by dimming or switching off. Bright lights are unnecessary throughout the night when there are fewer people or vehicles. If necessary, lights can be brightened. Dimming is typically not noticed by the public. 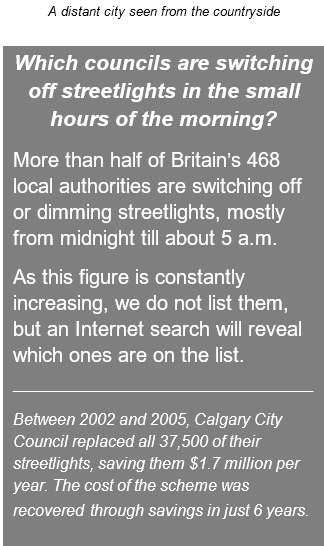 In York city centre, only 5% of respondents to a survey noticed that some lights had been dimmed. No crime was reported around dimmed lights. 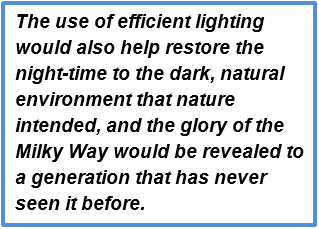 If adopted, both these methods would lead to a dramatic decrease in both the cost of street-lighting, and the amount of light pollution produced.